In an entertaining match, Anthony Knockaert fired Brighton ahead after only five minutes but Bournemouth levelled just past the half-hour mark when Steve Cook headed home against his former side. Glenn Murray put Albion back ahead three minutes into the second half as he netted against his old club but the Cherries levelled for a second time through Callum Wilson 11 minutes from time. In the first Premier League game of 2018, Albion made three changes as they played their fourth match in just nine days. Ezequiel Schelotto, Markus Suttner and Jose Izquierdo returned to the starting line-up in place of Bruno, Gaetan Bong and Solly March. Bournemouth made four changes from their 2-1 victory over Everton as Marc Pugh, Harry Arter, Benik Afobe and Charlie Daniels all came into the starting 11. Ryan Fraser, the two-goal hero against Everton, missed out through injury and Nathan Ake, who had started all 21 of the Cherries' league games this season, was on the bench after picking up a knock against the Toffees. Brighton went into the match having scored just twice in nine Premier League matches but started brightly and took the lead after only five minutes. Shane Duffy switched the ball out wide to left-back Suttner. He found Pascal Gross, whose touch released Izquierdo and the Columbian winger squared for Knockaert to steer the ball home from a tight angle. Izquierdo almost made it 2-0 moments later when he flashed a shot just wide from 25 yards, before Bournemouth created their first opening but Wilson sent a left-footed effort the wrong side of Mathew Ryan's far post. Knockaert slid in to block a Harry Arter drive on 22 minutes, while Albion went close to a second on 27 minutes when Gross found Murray and his shot across goal was pushed to safety by Asmir Begovic. Jordon Ibe, who set up both Bournemouth goals in the Cherries' 2-1 win over Albion in September, had a well-struck 20-yarder saved by Ryan on the half-hour mark, before Suttner poked Steve Cook's downward header to safety. Albion failed to heed the warnings from that let-off as from the resulting Ibe corner, Cook rose highest to head home inside the far post with no Brighton player on the line to draw Bournemouth level on 32 minutes. 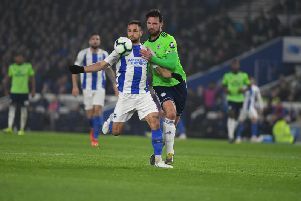 Ryan ensured Brighton remained on level terms when he saved Charlie Daniels' free kick on 37 minutes, before Albion had a great chance to go back ahead as Gross' cross found Izquierdo, who was denied by the legs of Begovic from six yards. Chances continued to come and go at both ends as Ryan got down low to keep out Marc Pugh's shot as the sides went in level at half-time. It took Albion just three minutes of the second half to go back ahead and it came from another superb team move. Gross' pass set Izquierdo free and he unselfishly squared for Murray to take a couple of touches and side-foot home his sixth goal of the season. Bournemouth almost responded immediately but Ryan came out to block Ibe's shot at the near post. Begovic denied Knockaert a second when he kept out the French winger's dipping shot on 53 minutes, before Duffy's toe-poked effort after Gross' corner landed at his feet was blocked by the Cherries defence. The visitors had penalty appeals waved away just past the hour when Wilson went to ground in an aerial challenge with Schelotto. Izquierdo had a golden chance to put Brighton 3-1 ahead on 68 minutes when he broke clear from his own penalty area but was denied by Begovic when one-on-one with the Cherries keeper. At the other end, Bournemouth went agonisingly close to equalising on 73 minutes when Ibe's low drive from 22 yards hit a post, rebounded against Ryan and went out for a corner. The Cherries levelled for a second time 11 minutes from time when Albion failed to clear their lines from a goalmouth scramble following a corner and Wilson poked the ball home from close range. Wilson forced Ryan into a sharp save at his near post on 85 minutes, while Knockaert shot wide at the near post as Albion threatened three minutes later but it ended honours even. BRIGHTON: Ryan; Schelotto (Bruno 76), Duffy, Dunk, Suttner; Knockaert, Stephens, Propper, Izquierdo; Gross (Brown 88); Murray. Subs: Kayal, Hemed, Goldson, March, Krul. BOURNEMOUTH: Begovic; Francis, S.Cook, Pugh (Ake 60), Arter (Gosling 71), Afobe (Mousset 66), Daniels, Wilson, A.Smith, L.Cook, Ibe. Subs: Boruc, Gosling, Surman, Mousset, Butcher, Simpson.